A View on Hampstead Heath, looking towards London. 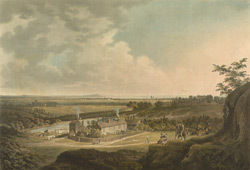 bl.uk > Online Gallery Home	> Online exhibitions	> King George III Topographical Collection	> A View on Hampstead Heath, looking towards London. Rural Hampstead was infested with wolves as late as the 13th Century, and only became a fashionable area to live near with the discovery of springs which were purported to have healing properties in 1698. It has traditionally been popular with writers and poets; the Kit-Kat Club, whose members included Steele, Pope and Dr. Arbuthnot, met at the Upper Flask in East Heath Road; Keats, Leigh Hunt and Shelley were also frequent visitors.